I've been using the bullet journal system in a Stalogy 365 A6 notebook since July 2017! You can read more about my five month check-up. I thought it was a great system for a college student: I could keep track of everything, and take note of what wasn't done by the end of the day. But like any stationery nerd, I started getting irked by some features of the notebook. Firstly, the Stalogy grid is 5mm, which is quite large for such a small notebook; for comparison, the Hobonichi Techo uses 4mm. One millimeter may not seem like a big difference, but when you're planning in an A6-sized notebook, even one extra square counts quite a bit. The grid is also an awkward 25x16 size. I divided the page into Monday through Wednesday on the left side, and Thursday through Sunday on the right, with the weekend doubling into two columns. 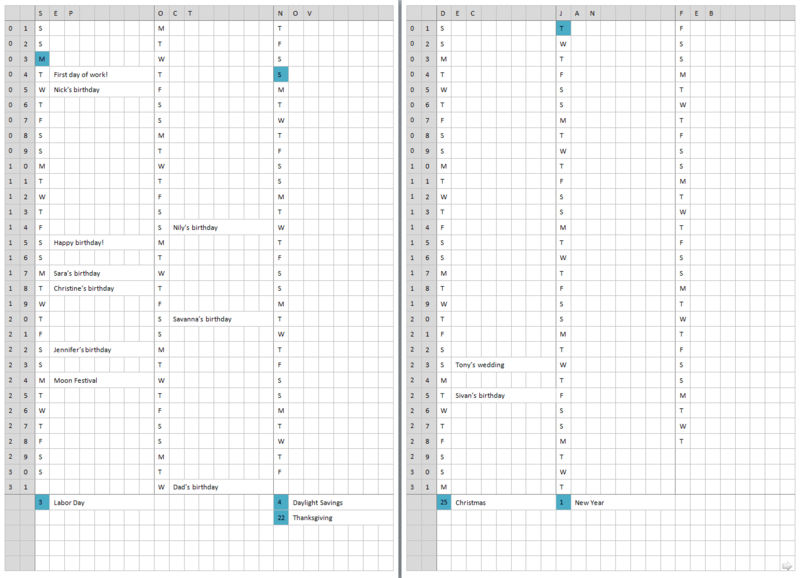 That gave me an extra four rows for miscellaneous tasks and planning ahead, but that's really not a whole lot of space. Lastly, I never used the time/date system at the top of the page. To be fair, I used the Stalogy as a week-at-a-glance planner rather than a daily one. Regardless, the top of the page was kind of wasted space for me. Towards the end of my college career, and especially over the summer, my bullet journal usage dropped off drastically. I was barely even tracking my habits. But it's September! The start of a new season! And I have my first post-college job! It's time to get back into it. I decided to try out a couple of new things for the month of September: using a combination personal/work planner, and a vertical time-oriented format. I've never tried the vertical format, which is what you find in something like a Jibun Techo. The bullet journal is more task-oriented, since you write a list of what you need to get done that day. I figure that if I don't like the vertical format, I can just move back to the bullet journal. Because I'm the most Virgo a Virgo will ever be, I planned my planner using a Word document before I ever put pen to paper. This does give me the benefit of having pictures to show off my planner format, and we can just pretend I did this specifically for this blog post, okay? First off is the year at a glance (really, a half-year at a glance), which is two two-page spreads (four pages total). The idea's pretty simple here: just put down stuff that happens every year, like birthdays and holidays, or big events that I need to plan for, like a wedding. I plan to use this as a resource at the start of every month to copy down holidays and such. The month-at-a-glance is what it sounds like! I copy over some events to celebrate, and things that can be planned a couple of weeks ahead, like appointments. I gave myself space to mark down tasks that should be finished that month. Perhaps I can use that space for other stuff, too. My habit tracker only takes up one page. I don't mind the vertical format, but I might reorient it so the dates are on the right side rather than the left. If I don't complete a habit, I'll fill a box halfway. 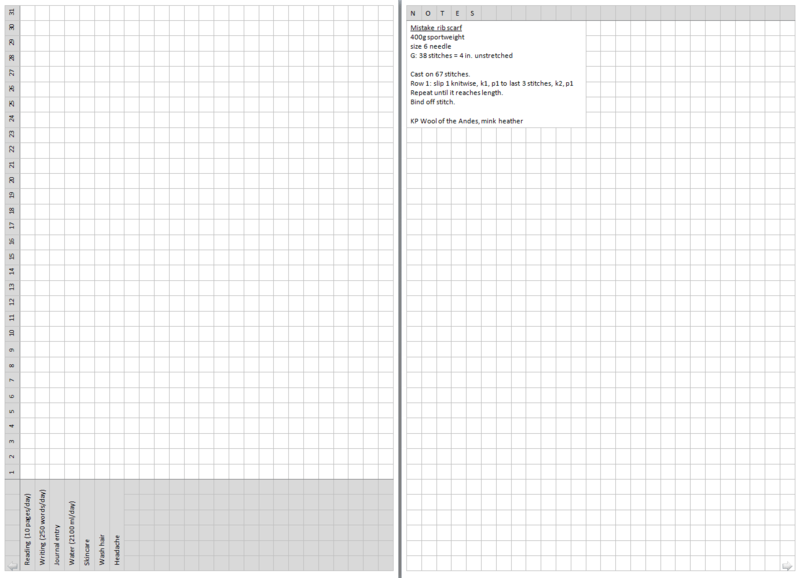 The second page for some miscellaneous notes, like my current knitting project. The meat and potatoes! This is the week-at-a-glance. On the left side, I have tasks that need to be done during the week. At the top, I keep track of the weather so I know how to dress for that day, or bring an umbrella. At the bottom, I have a separate space for tasks that can be done whenever during that day. On workdays, I gave myself an hourly schedule from 8 to 10 pm. For weekends, when I can sleep in a bit, my schedule goes from 10 am to midnight. Not too awful, I don't think! I wanted my schedule to be as modular as possible, giving myself plenty of space to add trackers or other pages as necessary. This means I need to fight the urge to format my entire planner in one boredom-fueled craze. For my planner, I'm using a Nanami Paper Cafe Note. It's an A6 notebook with 480 pages of Tomoe River paper. 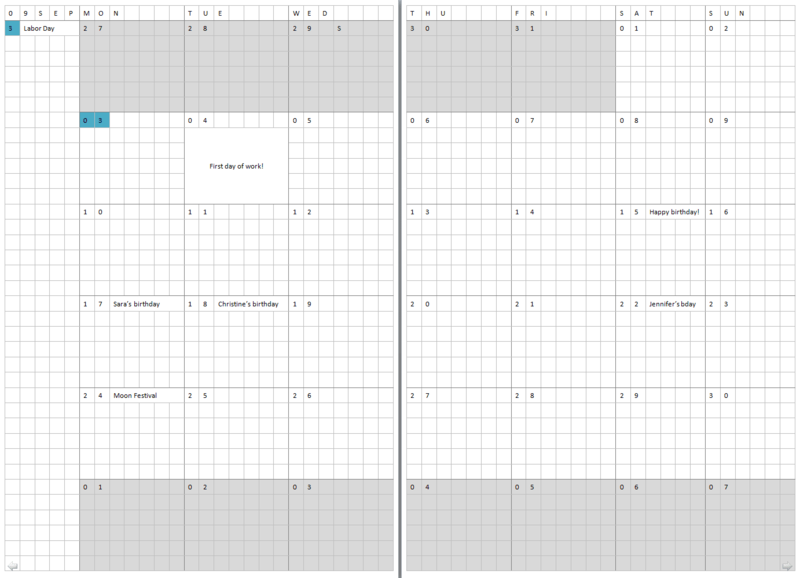 I much prefer the full-page grid rather than the one with little blank boxes. It fits nicely into a Midori MD 4x6 plastic cover, though the top cover does get lifted quite a bit. 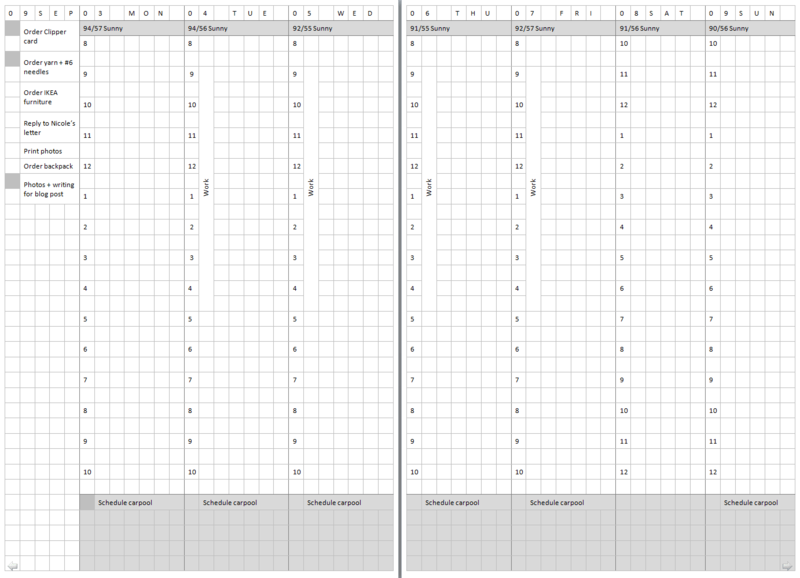 This isn't a Cafe Note review, but I found that it's a 37x26 grid: the boxes are tiny! I had to dust off an EF nib. Right now I'm using a Faber Castell Essentio, but I might get a Pilot Kakuno with a fine nib; they're cute and light, but also ultra fine for a sub-$15 pen. My plan is to use a different ink color every month. September is J. Herbin Ambre de Birmanie, which is a good highlighting color too. We'll see how that goes! I'll probably add gel pens, ballpoint pens, and highlighters at some point in the future. Maybe they'll make an appearance in my retrospective. I plan on writing an update to this blog at the end of the year! Stay tuned for that.